Sri Lanka have tuned up for their three-match T20 series against Australia in style by dispatching a Prime Minister’s XI in Canberra. Set 170 for victory, the Sri Lankan openers came out all guns blazing and put 69 on the board in the first six overs in Wednesday night’s tour match at Manuka Oval. Chief destroyer Niroshan Dickwella smashed eight fours and an audacious six scooped over third man on his way to 47 off 26 deliveries as he and stand-in skipper Upul Tharanga dominated the powerplay. An attempted paddle sweep brought about Dickwella’s demise and he was caught behind off 18-year-old offspinner Arjun Nair. That brought Dilshan Munaweera (32 off 19) to the crease as he linked up with Tharanga for a 53-run partnership. With Sri Lanka looking destined for victory, part-time spinner D’Arcy Short (2-19 off three overs) picked up Milinda Siriwardana (25) and Chamara Kapugedera (0) in successive balls and nearly had a hat-trick with Seekkuge Prasanna beaten all ends up by a full delivery. But it was too late for the home side, with the tourists cruising home to win by five wickets with 17 balls to spare. Sri Lanka’s poor fielding had cost them after winning the toss and electing to bowl, with PM’s XI captain Adam Voges (54no) and Sam Heazlett (58) scoring half-centuries after being dropped early in their innings. Voges, playing in the match marking the end of his international career, confidently pushed the ball around Manuka in front of more than 7500 people, hitting four fours and one six. 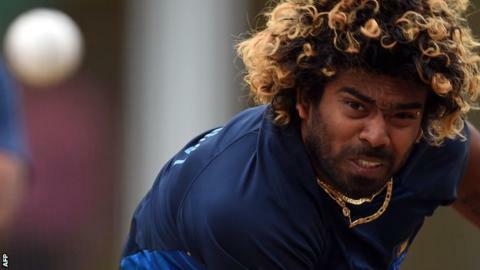 After almost a year out of cricket due to illness and injury, Lasith Malinga took four balls to find his range, knocking Short’s middle stump out of the ground. Vikum Sanjaya was the pick of the bowlers and was crowned man of the match for his 3-26 off his four overs, while Malinga finished with 1-26 after getting the ball to swing early and finding the mark with his yorkers. Sri Lanka travel to Melbourne for the first match against Australia on Friday night before the series moves to Geelong on Sunday and finishes in Adelaide on Wednesday.